Modern dance with acrobatic and floor work, lots of inspiration from breakdance. Today I will share with you a great interview with a talented dancer, gymnast and aerialist Josefine Stenström. 1. Josy, could you please tell me about your experience in gymnastics and dance? I started with artistic gymnastic when I was 5 years old. I trained 5 days/week and went to competitions and gymnastic camps in different places in Sweden. I was an elite gymnast until I was 13 years old, then I hurt my back really bad and I couldn’t continue with the bigger competitions. A year later I started with ”teamgymnastics” and did that for a few years. I started with dancing when I was 15 and when I was 19 I moved to Munich, Germany for a professional dance education – ”Iwanson professional school of contemporary dance”. There I trained balett, modern, jazz, hiphop, floorbar etc. monday to friday from 09.00-16.00. After 3 years I graduated and started to work directly as a freelance dancer. I went to an audition in Salzburg, Austria and got the honor to be a part of 2 months tour in England with ”Nobulus crew” a breakdance company from Salzburg. You can read about the crew here. After that I went back to Germany and worked for Armani, RedBull, Siemens, Hyundai, Volkswagen, Schwarzkopf, Corona, Campari, Thomas Sabo and some other projects. 2. How does your usual day look like? How many hours do you train daily? How long do you stretch? It depends where I am at the moment, what possibilities I have for training and If I have work or not. But I train almost everyday, sometimes 2 or 3 times/day. Some days can look like this: I start at the gym around 10.00 with some cardio (running, biking or cross trainer that´s better for my knees) then I make some different exercises for legs, stomach and arms (free training. Not a big fan of the machines). Then I finish with stretch. So I’m finish around 12.00 and then eat lunch. Around 14.00 I have 2 hours dance class. Then back home and eat again and off to aerial training (silk) that I actually started with for some months ago only. And now I’m stuck and want to keep training this every week! And I practice the silk for about 2-3 hours (with warm up and stretch). So my best training days is mixed with the gym, dance and aerial silk. Around 6 hours training. The stretch is always different, If I have a class after the other I make a fast stretch just because it feels good for the body and then I try to make a longer stretch after the last ”workout”. Around 30 min, sometimes longer and sometimes shorter. 3. What training tips from gymnastics can you give to an aerialist? For me the strength in arms and stomach is really important, also flexibility. Hands and wrists as well. 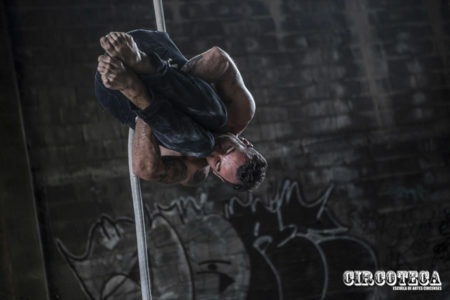 Arial training is a lot about technique, so if you always keep your strength and flexibility, the aerial training will be easier, I think. But to be a good aerialist you need to practice this a lot. 4. Which dance style do you like most? In which countries have you performed? How is the cultural scene there? Modern dance. Floor work and dynamic choreos. I like to mix the modern dance with acrobatic and floor work, lots of inspiration from breakdance. I have performed in Sweden, Germany, Austria and England. For me the cultural scene is best in Germany. Lots of great artists there and more possibilities for training and work. Especially if I compare Germany to Sweden. Thats why I moved also because its not so many jobs for dancers in Sweden. 5. Is it difficult to find jobs abroad for a dancer? Which website can you recommend for dancers and artists who are looking for gigs? Yes It’s not that easy in the beginning. It’s a lot about contacts and to get to know people. You have to show yourself, in classes, videos or auditions for example. I don’t have a special website or so but sometimes I just google for auditions or I get tips from people. 6. How long does it take you to prepare a show or a dance performance? How long is your warm-up before dancing? It depends, sometimes its just one show day so then the rehearsal is one day before (about 7 hours) or rehearsal 2-3 days. Before the England tour we had rehearsal one month because the show was longer. It always depends on what show it is and how long it is. I warm up for maybe 20 minutes, some strength to get warm and then easy stretch. 7. What are your favorite music bands or singers for dancing? I like many different kind of music but when I improvise alone I like to move to Ludovico Einaudi. 8. What are you doing at the moment and what are your future plans? 9. Could you please show some tricks, for example, how to jump into a Handstand for our readers. Thank you very much Josefine! Please share your experience how was learning handstand for you ? If you just started working on your handstands what is the most difficult for you?